Membership organisations like clubs and associations have a wide range of functions to perform. They also have to work efficiently and ensure that they provide the best services to their members. A host of different things like collecting membership applications and renewal, tracking memberships, collecting membership fees and optimising member retention have to be looked into by the organisation. Moreover, all such membership organisations provide a platform which connects people together and encourages communication and interaction. Hence, the services which these organisations provide should be of top quality. 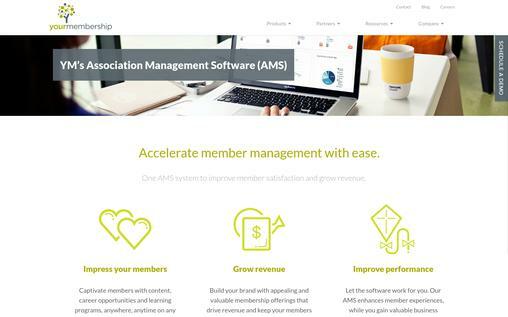 We have for you here a guide to the ten best membership management software which are available out there. This will most certainly help you in selecting the right software for your organisation. Wild apricot brings for you an excellent membership management software which will surely help you to provide the best services to members. This software has an array of excellent features which are easy to use as well. You can enhance your membership, communicate better with members and make your organisation grow using this great software. Create customised application forms online which can even be used on all mobile devices. The software enables you to provide group membership opportunities to families, companies and teams. Send customised confirmation emails to members on their membership approval. Process payments easily by using credit cards online. The software features WordPress integration. All reminders for renewals and invoices can be automated. Customise different memberships by setting different pricing, renewal and access policies for each membership level. This cloud-based software allows you to access all member information from your computer or any mobile device. Update all member records quickly by simply importing the present list of members from an Excel sheet. The member self-service feature enables members to renew and pay for memberships, register for events and do much more on the go. 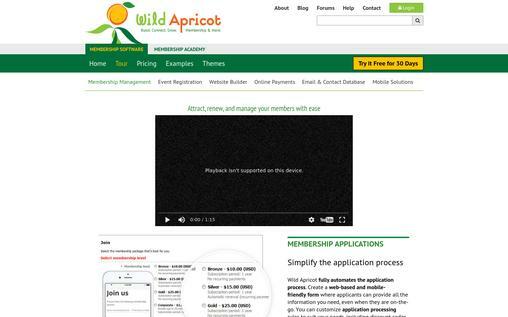 Set up and manage online member directories using Wild Apricot. Embed forms, directories and listings to create new websites or to add new features to your already existing website or the WordPress website. 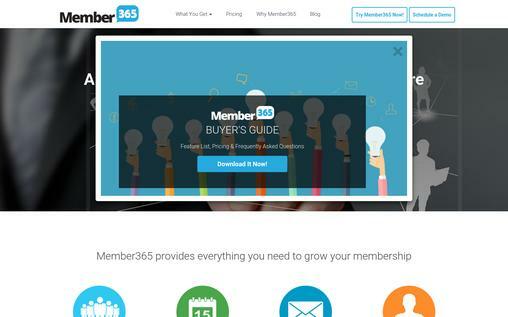 Member 365 is an all-inclusive membership management software which enables you to look into all aspects of your member organisations without having to use various applications. 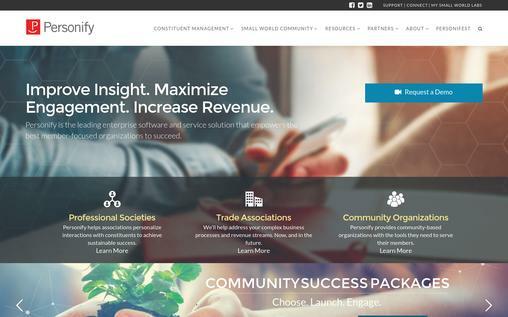 This amazing software provides varied services like committee management, email marketing, continuing education, learning management, membership management and much more. This unified platform is easy to use and saves your valuable time and expenditure as well. Efficient committee management enables groups and committees to work in a unified space and betters communication and collaboration. Contact record management allows you a complete view of each contact and also gives you additional fields to track and profile them. Automatically collect Continuing Education (CE) credits, reports and status of members, generate new methods for members to collect more credits and send confirmations once CE requirements are met. Send automated emails and eNewsletters to members and non-members. The software offers event creation, promotion and self-service for members where they can confirm or withdraw event registrations. Process payments, generate invoices, handle accounts and also generate accounting reports using Member 365. Create customisable web forms using the drag and drop editor and classify their access to members and contacts. Donation campaigns can be started by integrating them into membership applications and renewals. All lists and reports created are updated automatically and filters further allow you to narrow your search. All directories are auto created and the privacy tools can be used to manage display settings. Easily manage all applications for membership and automate renewals to optimise member retention. Member Portal allows member communication and collaboration and groups are also connected through a unified communication platform. Create customisable surveys and voting using the drag and drop editor and classify their access to members and contacts. 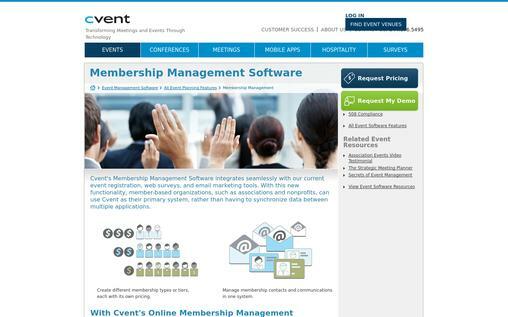 Cvent is one of the top quality membership management software available today. With the use of this single software you can perform a number of functions like email marketing, event registrations, online surveys and much more. Hence, there is no longer any need for you to use multiple applications to address different needs. All sign-ups and renewals for event registrations can be performed online and all renewal reminders and confirmations on purchase are sent automatically. Advanced email marketing tools enable you to send newsletters, promote events and make announcements through email. The advanced reports allow you to keep a track of all membership registrations, renewals and expirations. The directories with elaborate contact profiles enable you to improve communication. The customised online portal enables members to see their attendance and their payment and registration records. Easily collect all membership and registration fees. Cvent automates all sign-up and renewal processes on your website. Optimise the retention rates of members by offering incentives like discounts, sending personalised messages through data tags and sending automated reminders to members. All members have complete privacy control through which they can control or hide their personal information and membership status. Members can view all past events and present event details and can even promote all future events. Create different customised websites for different memberships and also restrict their visibility according to the type of membership. Yourmembership is an extremely good membership management software. The members will surely be impressed with whatever this software has to offer. This will enable you to increase member retention rates and consequently increase your revenues. This is an all in one software with which you can manage all your business without having to use various applications. Create customised and easy to use websites which can be accessed from any place and at any time. The software offers social networking with which members can connect and communicate in groups or even in chapters and committees. The fully customisable member profiles enable them to connect with people professionally and market themselves from any place using any device. The Continuing Education Units (CEUs) can be easily tracked and maintained using Your membership. Make use of the email marketing tools to send communications to members in the form of newsletters, reminders and more. The Career Center offers job opportunities to existing and new members. The excellent dues management tools have fully configurable rules for pricing and member permissions which can be used to easily collect all fresh and recurring dues. Manage all business operations like registrations, dues, donations and more from one centralised commerce system area. All accounting processes can be managed with ease using the accounting and financial reports. The advanced analytics and dashboard functionality gives you a clear picture of the entire organisational functioning. The live support team offers training and effective customer service. Silkstart is an amazing cloud-based membership management software which gives you the best connectivity with your members. You can easily communicate with members, send emails, newsletters and so much more through this great software. The software provides a user-friendly and fully customisable interface for your members. All information of members is securely stored and you can easily add, update and renew members. All payments can be collected easily by Stripe, Paypal, Beanstream and Authorise.net. The software automates all reminder notifications for expiry and welcome. All member data is saved in a centralised database and it can be updated by members and admins. Manage all types of membership like organisations and individuals, monitor all active inactive and prospective members and even the payment status using Silkstart. The sign-up process is easy and automated and has fully customised enrolment forms, reminders and easy payment processing. Create different membership plans and various billing cycles like monthly, quarterly or annual. Create different membership levels with specialised benefits and customised pricing. Generate advanced and detailed reports on members seamlessly. This cloud-based software allows members to access their profile, update and renew membership from any mobile device. Member Leap has brought for users a super functioning membership management software. 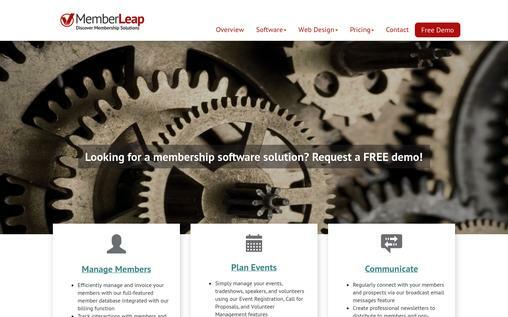 Manage all memberships, interactions, communications, events and much more using Member Leap. You can also get members registered and process all payments easily with this great software. Use the member database to handle all memberships, record all member information, keep a record of all membership plans, levels and more. The private member directory which stores all member data can be searched using any member criteria and is displayed on the main website. All prospective members can fill up the membership interest form requesting more information. Members can log in and update their own contact information in the online member portal area. Record all communications with members and also send reminders using the customer relationship management (CRM) system. The quick reports and custom reporting feature generates instant reports or customised reports to view fully formatted member lists, address lists and much more. Use the membership billing feature to manage all dues, generate invoices send notification emails for renewal and more. Process online payments easily using Paypal, Cleargate, Authorise.net, Heartland and various other payment interfaces. The fully searchable public member directory with restricted information can be displayed on the website. The software features integration with QuickBooks interface. Personify is a widely trusted membership management software brand today. You are sure to optimise your organisation’s membership and revenues with the host of solutions this software offers. Personify allows better and personalised communication with members, provides solutions to all intrinsic business procedures and also caters to the needs of community organisations. Personify 360 provides an extensive and fully expandable platform to manage all complex business processes. Make use of the varied Personify 360 modules to manage member data, events, promotions, awards, committees, meetings and much more. Personify 360 eBusiness provides a fully customisable and responsive platform through which all members can manage their own interactions and transactions. Personify 360 Analytics works on SAP Business Objects and generates advanced reports which can be studied in depth and gives you a clear insight into all aspects of your organisation’s functioning. Use the Personify Mobile app to get access to your website and manage events from any place and at any time. Personify Cloud gives you a fully expandable cloud-based software which ensures the smooth running of your system. The Personify Client Services team provides services which are completely tailor-made to your organisation’s needs. Your membership management organisation is sure to function smoothly, maximise member retention and earn more revenues using Zenbership. 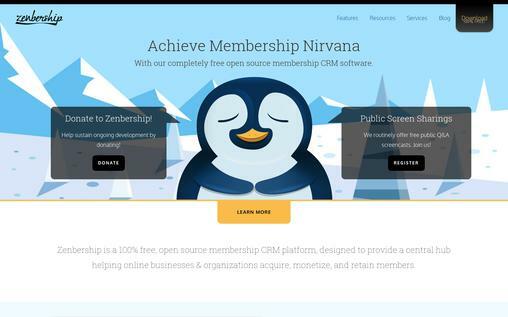 This membership management software provides a completely free and open source software for membership organisations. The CRM is tailor made for websites of membership organisations and is fully customisable. It surely helps you win more members. All important membership management tasks like registrations, renewals, payments, invoice generation, reminders and more are fully automated. Use the software’s subscription system to collect all membership dues seamlessly. Access to any website content can be created, secured and sold individually or as a package. Generate custom reports with customised fields which can be searched using flexible criteria. Create a fully customised member directory using the directory plugin. All important data can be secured and encrypted using the excellent data security feature. The software makes sure that only paid members to get access to ‘Member’s only’ content through their password sharing detection and prevention of concurrent login. All fields of the membership database are fully customisable. 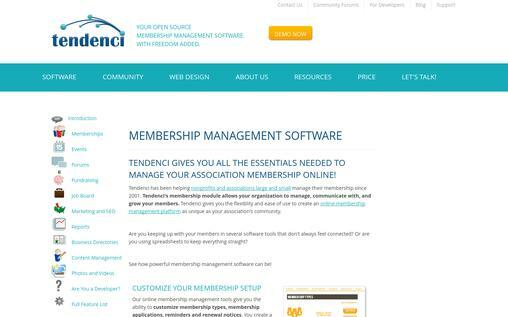 All small and large membership associations have been immensely benefitted by this great membership management software called Tendenci. Managing memberships and communicating with members has become a lot easier with this software. This in turn helps you grow your revenues and also enhance member retention. All important membership management functions like managing membership types, renewals, reminders and applications are fully customisable. Enhance member retention by offering more benefits for members. Make use of the selective control settings to manage what content your members can view, get access to or update. Members can schedule events, share photos and even give article updates using the distributed authorship feature. Profiles of members are generated automatically and can be used and updated with a username and password. View all member information in the membership directory which is fully searchable. Create and customise varied types of memberships and even classify members under special interest groups using Tendenci. The software offers integration with social media, photo and video galleries to enhance engagement with members. Send newsletters, recent contents, job openings and more using the email marketing tools. The reporting tools enable you to generate detailed reports on day to day happenings and key functionalities. With Weblink Connect you get an excellent and easy to use membership management software which comes with a host of great features. The software provides an user-friendly interface which can be used at any place and at any time. The software provides a unified platform to address all your financial, sales, marketing, website and event management needs. Weblink Connect provides an easy to use interface which can be used through your PC, mobile browser or the app for iPad. With this software you can access all your information at any time and from any place. Weblink Connect provides you an all in one solution to manage memberships, sales, marketing, accounting, events and more. The software easily integrates with your website. Weblink Connect provides a fully responsive website design which adjusts itself and gives the best viewing on your PC, laptop, mobile or tablet. 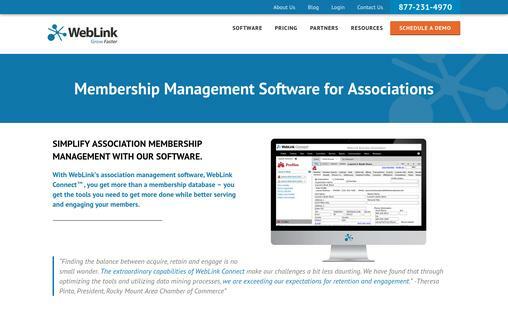 Weblink Connect offers a fully customisable membership management software. The powerful reporting tools help you generate detailed membership, event and accounting reports and give you a comprehensive view of your data. Most membership organisations today are aiming at providing quick and efficient services to members. This has led to an increase in the demand for good membership management software. 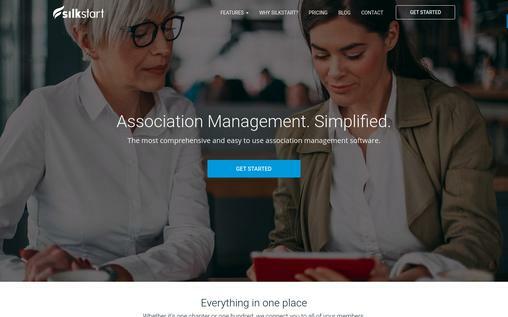 This exhaustive guide to the ten best membership management software gives you a clear insight into the features and functioning of the software. This will surely prove helpful and enable you to make the apt choice of software for your membership organisation. Speak up to the customers directly via email marketing as nothing could be better than this if you wish to achieve lucrative conversions. Presenting you MailGet Bolt – the smartest email marketing software which allows you to send bulk emails in just one click.